“I’ve spilled a good deal of ink on craft beer in the past, discussing how regulations have factored into the big beer monopolies, and questioning whether small brewers need to be unionized the way the big brew shops do. I’ve also written about craft beer as it applies to the “human economy” (more on the human economy here). 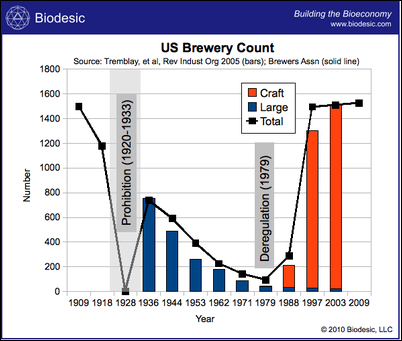 Suffice to say, the American beer industry fascinates me, not least of all because until quite recently it was dominated by a handful of very big corporations making a very limited, and subpar range of brews. The craft brew revolution has changed all that. Craft beers are now brewed across the United States, and the number of small breweries has shot up exponentially in the past few decades.